Double Eight-directional Knight Shogi (Japanese: ç›¸å…«æ–¹æ¡‚å°†æ£‹, ai happoukei shougi) is a shogi rule variant. It is closely related to the Eight-directional Knight shogi variant. The initial setup is completely the same as normal shogi. The pieces are the same as in normal shogi, with the exception that both players' knights are replaced by Eight-directional Knights. 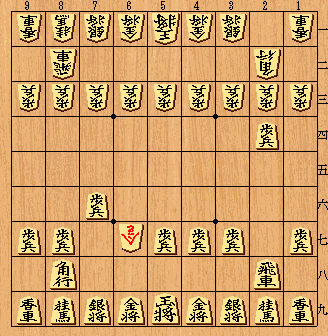 This contrasts with normal Eight-directional Knight Shogi, where only 1 player (ä¸Šæ‰‹, uwate, the handicap-giver) has the Eight-directional Knights while the other player has normal shogi knights. Unpromoted Eight-directional Knights move the same as Western chess knights, being (2,1) or (1,2) leapers. If an Eight-directional Knight moves to a promotional zone, it becomes an Eight-directional Promoted Knight (Japanese: å…«æ–¹æˆæ¡‚, or simply æˆæ¡‚), which, in addition to moving as a gold (as a normal promoted knight does in shogi), may move also as a Western Chess Knight. In fact, this piece is so powerful it could deliver mate with relative ease without requiring a protector, as normal shogi pieces generally do when giving checkmate. Note that, since the Eight-directional Knight no longer only moves forward, it is not against the rules in this variant to drop the Eight-directional Knight on the furthest back ranks. In the example diagram below, the black king has already been mated by the Eight-directional Promoted Knight alone.